Santa Fe, New Mexico – On September 1st, 2018, The Clark Hulings Fund for Visual Artists (CHF) will begin accepting applications for its 2019 Business Accelerator Program, an intensive year-long course of business study for professional working artists. Through this innovative web-based program, currently in its fifth year, the national nonprofit organization is transforming the art industry by providing visual artists with the business training they need to succeed as entrepreneurs and make a complete living through the creation of their art. A total of 20 Fellows will be selected to receive free tuition for CHF’s 2019 Business Accelerator, which will provide them with customized business training, network-building opportunities, publicity, and one-on-one support to boost their careers and make their art practices self-sustaining. At the end of year one, each Fellow will have established a viable business objective and developed an “investment-grade” business plan for an entrepreneurial project that furthers the objective. A select group of the 2019 Fellows will be chosen to continue on to the program’s second year, during which they will work directly with the Accelerator team to hone their skills, ensure accountability, and capitalize their proposed projects. Visual artists are fully capable of achieving these goals, but they just need access to the right resources and skills. CHF’s comprehensive Business Accelerator Program provides all this and more. Through the program’s monthly workshops, interactive labs, and required assignments, participants obtain practical training that’s actionable in the real world. They learn how to develop a business strategy, hone their brand narrative, be proactive about marketing, find buyers for their art, negotiate contracts, handle copyrights, communicate more effectively, and manage their finances and taxes. Every session is led by a subject-matter expert, and labs include extensive time for Q&A, allowing the Fellows to get feedback on their specific business questions and hear each other’s perspectives. Fellows also receive free all-inclusive access to CHF’s comprehensive digital learning portal, which delivers business education to artists in formats they already consume—learning videos and tools, expert columns, Q&As with leading figures in the art world, and podcasts that are distributed through iTunes and other syndicated networks. Although the educational components form the core of the Business Accelerator Program, participants also gain publicity for their work—through CHF’s Thriving Artist™ podcast, social-media accounts, press outreach, and other channels—and, even more importantly, they build a powerful network of allies via their peers in the program. Being a visual artist is often a solitary pursuit, but CHF Accelerator Fellows communicate with each other directly on an ongoing basis through workshop and labs, a closed Facebook group for current and past Fellows, and other one-on-one and small-group interactions. September 1 – September 30, 2018. Artists are strongly encouraged to pre-register here, to receive email updates on the application process and deadlines. In addition, pre-registrants will receive free “Colleague”-level access to our digital learning portal. CHF does not give preference to any particular movement, style, or art-world trend; all painters, sculptors, and artists working on paper are eligible. From the main group of 20 Fellows, a select subset will be chosen to move on to year two, during which CHF’s Accelerator team will provide one-on-one support to maximize the impact of what they learned in the first year and help them capitalize their projects. CHF’s 2019 Business Accelerator Fellows will be named in November 2018, and the program begins in January 2019. The Clark Hulings Fund for Visual Artists (CHF) is a 501(c)(3) nonprofit organization that champions economic sustainability for working artists. We do this by delivering business education and entrepreneurial learning through our rigorous Business Accelerator, a digital learning portal, in-person education events in local communities, and a federation of artist-formed and artist-led networks of opportunity. All of this work achieves one aim: equip visual artists to thrive as self-sustaining entrepreneurs. Los Angeles, CA – The Clark Hulings Fund (CHF), equips visual artists to be self-sustaining entrepreneurs by providing them with business training and support, is bringing its message of artist empowerment to Artexpo New York with a presentation on Friday April 20, at 2:45pm, at Pier 94, 711 12th Ave, New York, NY 10019. The panel, entitled “Mightier Marketing for Visual Artists,” will be given by Clark Hulings Fund Marketing and Education Director Daniel DiGriz. The talk will cover: understanding your audience to create messages that resonate; combining marketing channels to increase audience reach; turning an art practice into a compelling ongoing narrative and engaging social story; and collaborating with other artists to produce professional grade marketing events on a shoestring. After the talk Clark Hulings Fund Executive Director Elizabeth Hulings and Daniel will be available for five-minute one on one micro-consultations on marketing and art business strategy until 8pm. Artexpo New York takes place from April 19-22. This year, they will host over 400 innovative exhibiting artists, galleries, and publishers from across the globe, showcasing exciting original artwork, prints, paintings, drawings, sculpture, photography, ceramics, giclee, lithographs, glass works and more—all under one roof at Pier 94. The Clark Hulings Fund for Visual Artists (CHF) is a 501(c)(3) nonprofit organization that champions economic sustainability for working artists. We do this by delivering business education and entrepreneurial learning through a rigorous Business Accelerator, a Digital Learning Portal, in-person education events in local communities, and a federation of artist-formed and artist-led networks of opportunity. All of this achieves one aim: equip visual artists to thrive as self-sustaining entrepreneurs. Now celebrating its 40 Year Anniversary, Artexpo New York offers Three Shows in One Venue and the world’s largest fine art marketplace. Located at the renowned Pier 94 event venue in Manhattan, Artexpo New York brings together the largest international gathering of qualified trade buyers—including gallery owners and managers, art dealers, interior designers, architects, corporate art buyers and art and framing retailers. The annual curated expo introduces more than 400 of the world’s leading publishers, galleries and collectors face to face with hundreds of established and emerging artists from across the globe. More than 35,000 avid art enthusiasts attend each year to enjoy exciting and original artwork, prints, paintings, drawings, sculpture, photography, ceramics, giclee, lithographs and glass works – all under one roof and within 135,000 square feet of uninterrupted convention space. Alongside Artexpo New York, the world’s largest fine art trade show, is [SOLO] highlighting established and independent emerging artists and [FOTO SOLO] featuring fine art photography from some of the world’s finest abstract, contemporary and realist photographers. Artexpo New York also features its annual lineup of interactive and educational programming, including Art Labs, Spotlight Program, the LaunchPad Artist Program, and the Topics & Trends Education Program. For further information, visit www.artexponewyork.com. 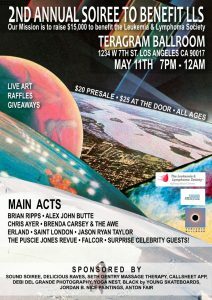 Sound Soiree is back with the 2nd Annual Benefit for The Leukemia & Lymphoma Society (LLS), taking place May 11 at the Westlake’s groovy DTLA adjacent venue Teragram Ballroom at 1234 w 7th St. Los Angeles, CA 90017. Singer/songwriters Jason Ryan Taylor and Brian Ripps are hosting with LLS Woman of the Year nominee, Stephanie Insalaco. In addition to Taylor previewing his upcoming album Creation Creator, popular indie artists Erland, Chris Ayer, Alex John Butte, and Saint London will perform, along with Puscie Jones and Brenda Carsey & the Awe who are back from last year’s event. Plus, Falcor aka Jared Krystyan, who was crucial to the 2015 Soiree for LLS, will be house DJ for the night. Pre-sale tickets are $20 and are available online or at the Teragram Ballroom Box Office or are $25 at the door. A limited number of VIP meet and greet tickets are available, including a chance to meet Robby Krieger from The Doors at the event. Noted Southern California poet Brian Michael Tracy will preview his upcoming ‘rock poetry’ album, The Mystical Prism of Being, at Venice’s church of the spoken word arts Beyond Baroque March 5 at 4:00pm. The event will be a fundraiser for the non-profit literary space. Tracy will be joined by noted musicians Bruce Springsteen collaborator Marty Rifkin, Andy Hill (Title Trackers, Hard Rain), and Renee Safier (Andy & Renee, Hard Rain), and up and comer Edoardo Tancredi. Tickets for the event are $25 in advance and available here ($30 at the door). The Mystical Prism of Being is unique in that it combines Tracy’s poetry with the musical talents of producer Rifkin, and South Bay music stalwarts Hill and Safier, performing a selection of beloved rock ballads interwoven with the poems. With three thirteen to seventeen minute tracks “A Virgin Birth,” “Our Last Supper,” and “Ascension,” the album is appropriately set for release on Good Friday, March 25. Renowned Grammy winning singer-songwriter, producer, and music director of global events David Pack is gearing up for quite an ambitious winter season featuring a holiday benefit single available Friday, an exciting NAMM presentation January 23, and the release of the Beato Band’s debut album with drummer and CEO of Beato Bags, Fred Beato February 26. Pack and Beato are reuniting for this eponymous album for the first time since they won the US Battle of the Bands together in 1968! Bhakti Fest, the preeminent sacred music and yoga festival dedicated to bringing spiritual and earthly empowerment to attendees and global recipients of the nonprofit festival’s charitable endeavors, will be returning to the Joshua Tree Retreat Center September 9-14. MANTRA-Sounds Into Silence, a feature-length documentary exploring the social phenomenon of chanting ancient mantras – known as Kirtan – is launching a crowdfunding campaign today here. Kirtan, a practice of devotional or Bhakti yoga, which highlights participatory call and response singing, is growing in popularity as westerners discover its uplifting, meditative effects. Practiced by enthusiasts of all religions or no religion at all, Kirtan blurs the lines between musician and audience as participants play a vital role in the music through their singing to produce a powerful, often transformative experience. 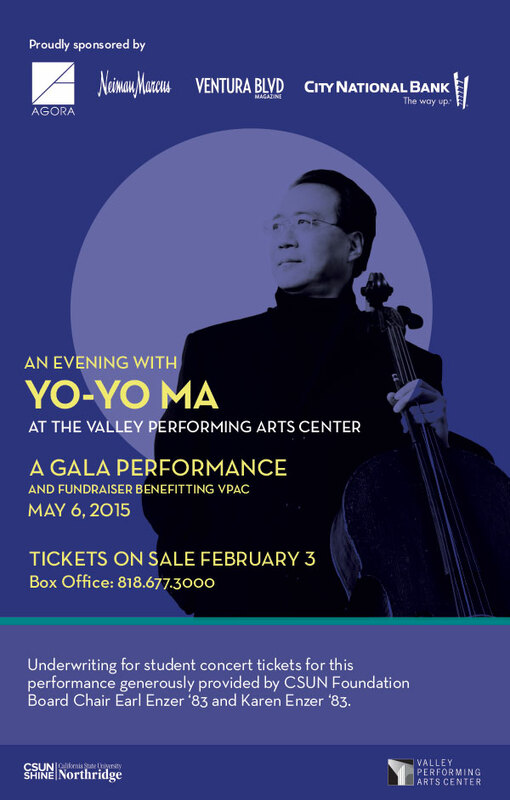 Valley Performing Arts Center is pleased to announce that its spring fundraising event will be a gala performance with the incomparable cellist Yo-Yo Ma. 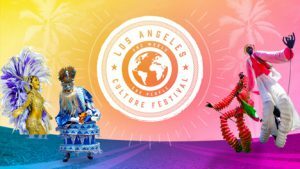 Taking place on May 6, the performance will begin at 6:30 p.m. Concert tickets that include a pre-show reception will be available starting today at http://www.valleyperformingartscenter.org/calendar/yo-yo-ma-gala/view/2015-05-06. The repertoire for the event will include three popular J.S. Bach suites – No. 1 in G Major, No. 2 in D minor, and No. 6 in D Major as well as pieces by modern classical composers Saygun and Mark O’Connor. The Liberty Hill Foundation, Los Angeles’ social justice foundation, is pleased to announce their 2014 Fund for Change grantees. The total fund of $864,000 is being invested in 32 of the most effective community organizing groups working on economic justice and LGBTQ justice in L.A. With grants ranging from $5,000 to $40,000, a wide range of neighborhoods and needs is being supported.